Host a dinner party with a difference! The Murder: Lord Shippe is blasted to death with his own gun! A tragic shooting accident... or was it? You and your guests will each play the part of one of the suspects, sharing information and hiding guilty secrets as you decide who dun the dastardly deed. 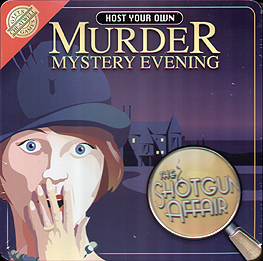 This thrilling Murder Mystery Evening is a battle of wits and cunning in which you'll vie to out-sleuth each other as you seek to solve the case - and reveal the monstrous murderer in your midst. We played The Shotgun Affair and all of us really enjoyed it. We definetly will be going to play more of these games in fact we have already bought Dead on Time and will be playing that soon. Thank you Cheatwell Games for a well enjoyed evening!